Guess what’s in the store? The NEW CHRISTMAS Hero Arts products are in the A2Z Scrapbooking store. Go shopping NOW! I made a tag to say hello, but then I wanted to experiment with colors, some were successful and some not so much. First up is my hello tag. With the tiger Lily stamp set, I like all the sentiments in this stamp set and I think they will be well used. . I also ordered the suggested ink cube pack, Desert Sun for stamping the flower. I used Dandelion for the bottom stamp, Tangerine for the middle and Strawberry for the top stamp. Lay the Spiral Stencil over the tag and sponge with Dandelion ink. No masking because the same color ink is used on the bottom flower layer. Stamp in order (stamping order on back of stamp set packaging. You can use any stencil with the same color as the bottom layer of the flower without masking. I put together some color combinations on my personal blog with the Color Layering Tiger Lily in various distress ink colors. Be sure to go down to the very bottom of my post at A Bit of This and That. . I was surprised how the white embossing looked on the final top stamp of this set. Categories: anything goes, color layering, Handmade Cards, Hero Arts, Stencil | Tags: 2018, a2z Scrapbooking, Arlene, die cut, distress inks, Flowers, Hero Arts, stencil | Permalink. Aloha and happy Monday friends! There’s a great selection of sale items in the a2z Scrapbooking store and today I’m featuring a few of them including the Tim Holtz Distress inks! So many good deals…definitely head on over! You know how I love a versatile stamp set that can be used for all kinds of occasions? This one is it! I stamped out the sentiment with Versamark ink and covered in Hero Arts White Embossing Powder on white cardstock. Then I used an ink blending tool to add Distress inks in Picked Raspberry, Twisted Citron, and Peacock Feathers. I wanted the “blessings” to be bright and with dimension, so I die cut the word twice and layered. For a fun edge, I used Lawn Fawn’s Valentine Borders die. 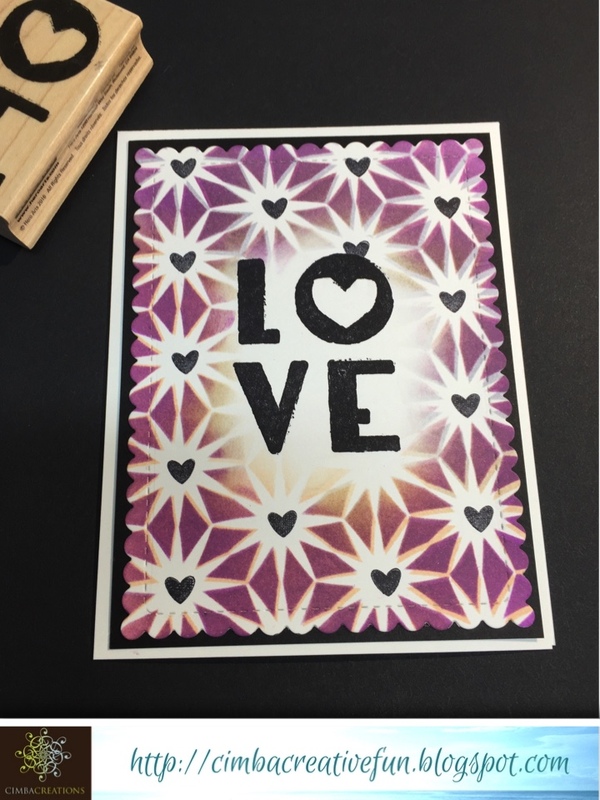 You can tell I was having way too much fun, so I made a second card adding the ombre hearts (also a part of the Blessings Stamp n Cuts) using Hero Arts Lilac to Grape Purple ombre ink. I changed up the design of the inking to follow the ombre hearts for fun and added some water droplets. That’s it for me today! I wish you all an awesome and creative week ahead! Categories: Handmade Cards, Hero Arts | Tags: Birthday, die cuts, distress inks, Niki G., Ombre | Permalink. I first created some stripes using Distress Inks in Twisted Citron, Peacock Feathers and Blueprint Sketch on Strathmore Mixed Media paper. Then I took the Hero Arts Peacock Feathers Stencil and layed it over and gave it a quick mist of water, blotting away the excess. This technique gives you a bit of a “bleached look.” Extra tips: fine mist works best and blotting right after. Also placing a darker layer of Distress Inks makes the “bleaching effect” more prominent. The sentiment is from Hero Arts Birthday Messages and is inked in Hero Arts Intense Black ink and added a couple of thin black strips of cardstock to bring out the black ink. To complete the look I added the new Hero Arts Ombre Ocean sequins. These sequins are gorgeous and I love that there are different shades and 2 different sizes! I hope this inspires you to join our monthly challenge for your chance to win $25 to the a2z Scrapbooking store! We also have ANOTHER chance for you to get a $25 gift certificate by simply commenting on each blog post throughout March! Mahalo for stopping by and good luck!! Categories: Handmade Cards, Hero Arts, Stencil | Tags: distress inks, happy birthday, Niki G., stencil | Permalink. Hi friends – have you had time to play along with our EMBELLISH IT challenge? We love stopping by to leave you some love on your creations – join us! Remember, you can shop our Etsy store any time and save 15% by using code: MicheleG15; and if I’ve used something you don’t see in the store, just ask, they happily do custom orders! Now, let’s get to creating shall we? Funny how you start with an idea in your head and in the end, it takes a 180! 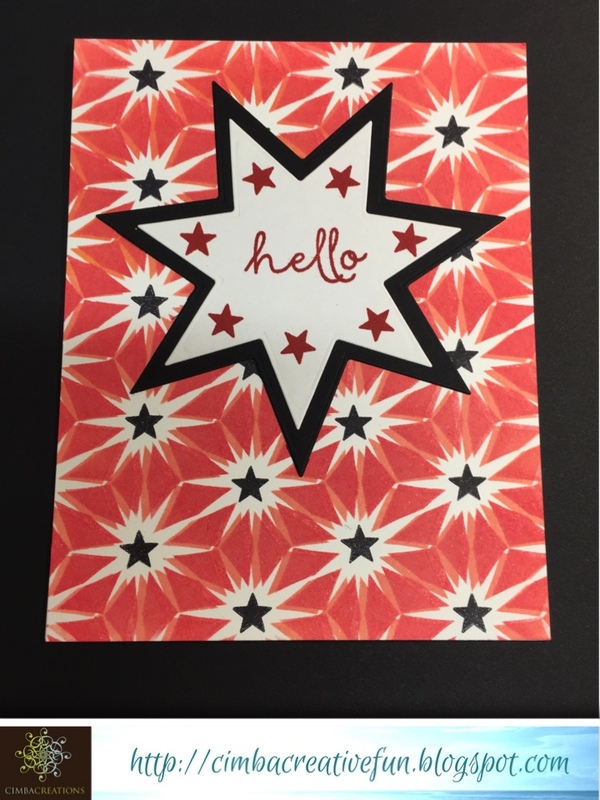 😉 I totally CASE’d (copy and share everything) THIS card from MFT Stamps but used the Hero Arts Coffee Cup Tags, Rings Bold Prints background stamp (as coffee rings in my eyes) and the Infinity Tags for a fun little gift card tag holder! I originally thought I would make a full size A2 card but after all the water coloring, die cutting and stamping was done I sat there for a solid 10 minutes staring at everything and it just wasn’t working. HA! Voila – a gift card tag holder was born. Not original, but it worked for the size ratio I felt I needed for the coffee cup. 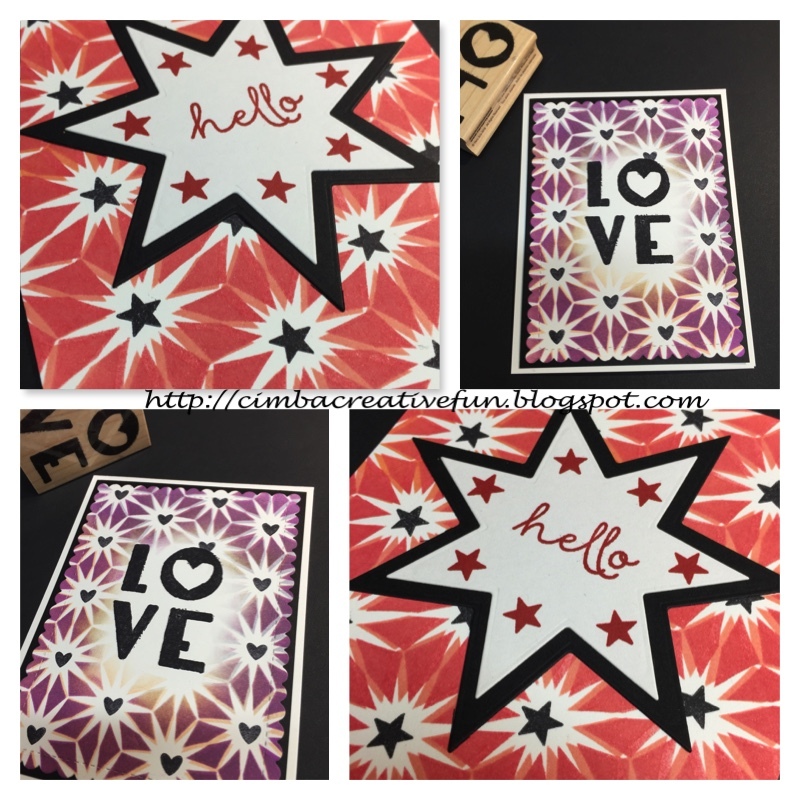 I started off with some water color paper I received a few months ago in a Hero Arts Monthly kit; stamped the Rings Bold Prints background stamp in VersaMark and covered with Hero Arts clear embossing powder. I then used various distress inks to lay down some watercolor; I kinda liked the red hue from the Tea Dye distress ink so gravitated towards those colors. The coffee cup, the sleeve and the lid were all cut from designer paper and sponged with various distress inks. The coffee cup was rather plain, so I used the leaves and berries in the stamp set to clear emboss over the cup – love how this added just the right texture! I embelished the cup with a little wooden heart from my stash. I cut another tag from Hero Arts Earth paper to place on the back, then cut the bottom portion of the tag again from designer paper cutting across the top with some decorative scissors and adhered this piece just around the edges so I could slip in a gift card. Finished it off with some twine colored with a burgundy copic so you can add it to a package or hang it on a tree! Thanks for stopping by; hope you’ll share your creations with us this month! Categories: Embossing, Handmade Cards, Hero Arts, Tags, Watercolor | Tags: Christmas, coffee cup, coffee dies, distress inks, embossing, gift card holder, Heat Embossing, holidays, Michele Greenwood, Rings Background Stamp, Tags | Permalink.